What’s the difference between whole grains, refined grains and enriched flour? All grains start life as whole grains. In their natural state growing in the fields, whole grains are the entire seed of a plant. Each of these parts contains valuable nutrients that play an important role in our diets. Because they still contain the bran and germ, whole grains are higher in Vitamin E and B6, phosphorus, magnesium, antioxidants, and fibre compared to refined grains. 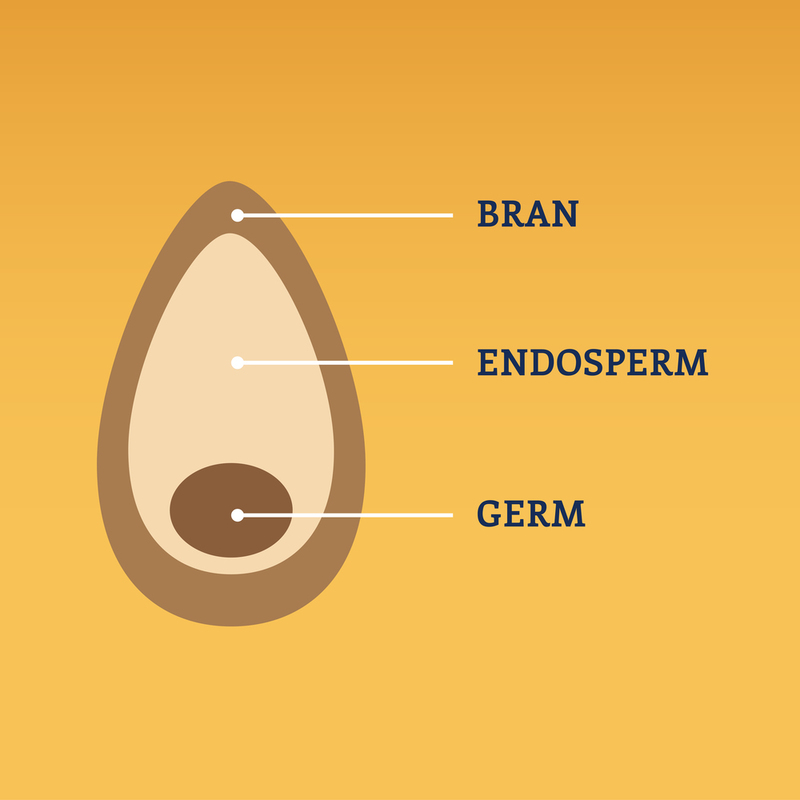 When you refine wheat into white flour the bran and the germ are removed, leaving the endosperm. In Canada, by law, refined wheat or white flour is enriched with vitamins and minerals, to a level equal to or higher than in whole grains. Originally, the enrichment of wheat flour simply replaced nutrients lost in the refining process, but today enriched flour is fortified with a higher amount of nutrients to provide health benefits. As a result, Canada’s Food Guide, and dietary guides from around the world, recommends eating a mix of whole and enriched grains. Are all refined flours enriched? In Canada, all refined wheat flour is enriched. You may see it in the grocery stores described as "enriched all-purpose white flour," or you may see it “enriched white flour” as an ingredient in many bakery products such as white bread, bagels, English muffins etc. Flours made from other grains, like rice flour, may be enriched, or may not be. To ensure you are buying enriched flour, check the label. Wheat gets a lot of attention because it’s the grain Canadians consume in the highest quantity†, since it’s used for making bread, pasta, cereals, crackers and baked goods. Wheat products exist in enriched as well as whole grain varieties, and go by many names. There are many varieties of wheat, like khorsan wheat (a larger, amber coloured grain), spelt (sometimes referred to as "dinkel" or "hulled" wheat) and einkorn ("single grain") that can be milled into flour in both refined and whole grain versions. Whole or cracked wheat kernels can also exist, and you may see them labelled as farro, bulgur, wheat berries and freekeh. What’s the difference between whole grain wheat, whole wheat and refined wheat flour? Whole wheat flour: This flour is missing five per cent of the grain kernel, including most of the germ and some of the bran. In Canada, up to five per cent of the wheat kernel can be removed during processing, requiring the name change from “whole grain flour” to “whole wheat flour.” The bran and much of the germ are removed to help reduce rancidity and prolong the shelf life of whole wheat flour. Refined wheat flour (all purpose): This flour contains the endosperm, with much of the bran and germ removed, and is enriched with iron, thiamine, niacin, ribloflavin and folic acid. It’s also known as all-purpose flour, or white flour. A product labelled “multigrain” simply means a flour that contains many different grains. Multigrain does not indicate whether a product contains whole grains or refined grains. Take a look at the ingredient list to find out more about which grains are included in the product. Whole grains are made of the entire kernel — the bran, germ and endosperm — and are an important source of antioxidants, fibre, vitamins and minerals. As part of a healthy, balanced diet, whole grains may help reduce the risks associated with heart disease, stroke, cancer, diabetes, dementia and obesity. Whole grains can be eaten whole, cracked, split or ground. They can also be milled into flour or used to make breads, cereals and other foods. What are the health benefits of refined enriched wheat? Refined wheat is enriched with vitamins and minerals to not only make up for what’s lost when the bran and germ are removed, but to provide even higher levels for nutritional benefit. For example, in Canada, all refined wheat flour is fortified with thiamine (vitamin B1), riboflavin (vitamin B2), niacin (vitamin B3), folic acid and iron. This provides a variety of benefits. For instance, B vitamins are essential for a healthy nervous system, while folic acid helps reduce the risk of neural tube birth defects like spina bifida. How many servings of grains should I eat each day? Grain products can come in all sorts of shapes and sizes. One bagel, for instance, could represent three servings. Be sure to check the weight on the package to be sure you’re not over-eating. Canada’s Food Guide recommends that at least half of your grain products should be whole grains, and that you should eat a variety of different whole grains like barley, brown rice, oats, quinoa and wheat. Even though grains contain a variety of important nutrients, eating more than the recommended amount is not better for you. As with any food, moderation is key. Why does Canada’s Food Guide recommend that HALF of our grain choices should be whole grains? Because both work better together. Since whole grains include all three parts of the grain kernel, they’re higher in fibre and contain a wider variety of vitamins, minerals and phytonutrients than refined grains. If they’re so healthy, you may wonder, why doesn’t the Food Guide recommend that all of our grain servings come from whole grains? The answer is because enriched grain products, like white bread, and pasta have health benefits too. They’ve been fortified with higher levels of nutrients such as iron, B-vitamins and folic acid than found in whole grain flour. Women who consume adequate folic acid before conception and in early pregnancy have a reduced risk of the fetus being affected by a neural tube defect. B-vitamins play a key role in metabolism (the process by which the body's cells convert food into energy) and help the body release energy from protein, fat and carbohydrates. B vitamins are also essential for a healthy nervous system. Both whole and enriched grains play important roles in the diet. Whole grains are good sources of fibre, vitamins and disease-fighting antioxidants, while enriched grains are an excellent source of iron and folic acid, the latter of which is known to reduce birth defects. It’s important to note that only white flours are enriched with iron, B-vitamins and folic acid; whole grain and whole wheat flours are not. How do white, whole wheat and whole grain breads compare in terms of nutrients? The chart below outlines the nutritional facts for one slice (35g) each of white, whole wheat and whole grain wheat bread. Note that white bread is higher in folate (folic acid), iron and B-vitamins, while the whole wheat and whole grain breads are higher in fibre, magnesium, potassium, zinc and vitamin E.
Which bread is the healthiest for me? There are many varieties of bread made from different flours. Whether you enjoy a crusty ciabatta, whole grain loaf or seeded wheat baguette, they can all contribute to a healthy diet in different ways. By following the Canada Food Guide and making half of the grains you consume whole grains, you can enjoy a mix of different types of bread in your diet. There are benefits of mixing it up, and getting fibre and antioxidants from whole grain breads, while enjoying white bread for the iron and folic acid it provides. How you consume your bread is also important. Both in terms of how much you have, and what you put on it! Follow the Canada Food Guide to make sure you don’t go over serving sizes and amounts. Because obesity is an important issue, many solutions have been proposed, but the fact is that there is no one cause of or solution to obesity – it has many causes, dependent on a range of factors. No single food or ingredient will make you gain weight, nor will any specific food be the solution to controlling it. Factors like genetics, activity level, environment, diet and social-economics can all influence weight. Fibre has been linked to weight control, so researchers are investigating the links between high fibre foods, like whole grains, and human weight control efforts. The findings largely indicate that people who consume three servings of whole grains as part of a balanced diet (one that also includes vegetables, fruit, legumes, nuts, lean protein and healthy fats), have a reduced risk for obesity and weight gain. In addition, having bread in the diet has been shown to help people adhere to calorie-controlled diets, important contributors to long-time dietary success. In short, data shows that the best diet for you is one that you can stick to. Should I avoid eating white bread and pasta to maintain a healthy weight? No one food group causes weight gain. Enjoying bread and pasta in controlled portions can be part of a healthy and balanced diet. That means having two slices of toast as a serving rather than six slices, or a cupful of pasta as a serving rather than five. What you put on your bread or pasta is also important, as it adds calories to your diet and can alter the speed at which your body digests carbohydrates. For example, toast with sugary jam will be rapidly digested, while toast with peanut butter will be slowly digested, keeping you feeling full longer and helping to control calorie intake.